The Department of Defense announced today that the deaths of Sergeant Andrew Joseph Baddick, 26, and Private First Class Kristian E. Parker, 23. Baddick drowned September 29, 2003, as he tried to rescue another soldier whose vehicle had entered a canal near Abu Ghraib Prison, Iraq. He was assigned to the 1st Battalion, 504th Parachute Infantry Regiment, Fort Bragg, North Carolina. Parker died on Sept. 29 of non-combat related injuries at Camp AS Sayliyah, Qatar. She was assigned to the 205th Engineer Battalion, U.S. Army National Guard, Slidell, Louisiana. Note: This is a corrected copy of News release 723-03 dated Oct. 1, 2003. 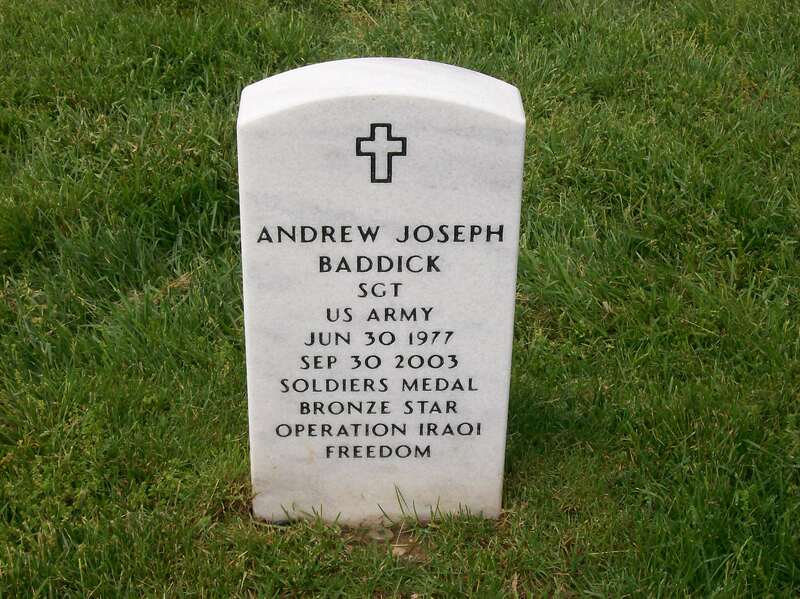 Sergeant Andrew Joseph Baddick, 26, of Jim Thorpe, Pennsylvania, drowned September 29, 2003, as he tried to rescue another soldier whose vehicle had entered a canal near Abu Ghraib Prison, Iraq. Baddick was assigned to 1st Battalion, 504th Parachute Infantry Regiment, 82nd Airborne Division, Fort Bragg, North Carolina. Private First Class Kristian E. Parker, 23, of Slidell, Louisiana, died on September 29, 2003, at Camp AS Sayliyah, Qatar. Parker died from non-combat related injuries. Parker was assigned to the 205th Engineer Battalion, Army National Guard, Slidell, Louisiana. Soldier's mother still seeks closure without having seen body. 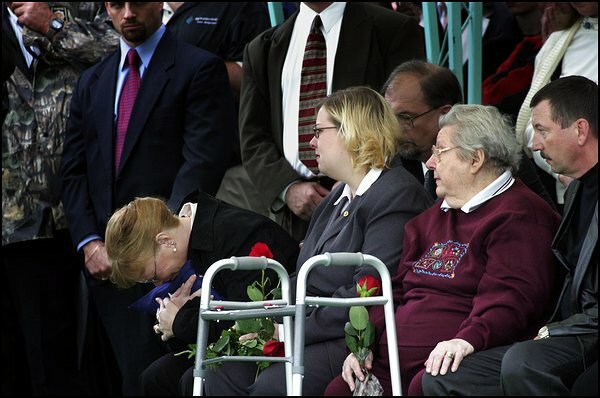 HARRISBURG, PENNSYLVANIA - Grief has cut hard into the heart of Ann Baddick, who mourns the death of her son, Sergeant Andrew J. Baddick of Jim Thorpe, on September 29, 2003, while he was trying to rescue a soldier in Iraq whose vehicle had plunged into a canal. Baddick's anguish over not seeing her son's body before burial overshadowed a visit Tuesday to Harrisburg, where state lawmakers honored A.J., as he was called, with a standing ovation. Also honored was Brian Firkal of Nesquehoning, who died trying to save a boy from drowning in Ocean City, Maryland, two days before Andrew Baddick was killed. 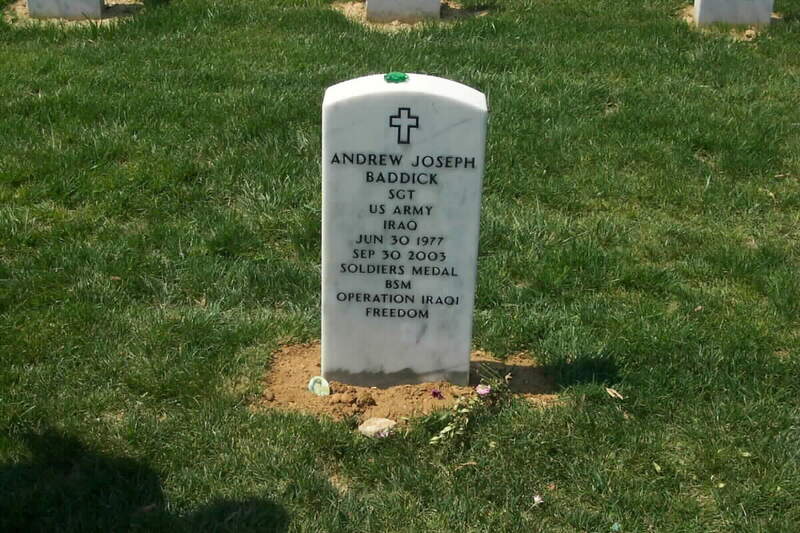 Baddick, 26, was buried at Arlington National Cemetery on October 14, 2003. Without telling her why, Ann Baddick said, the Army refused to let her view her son's body. The Army even denied her plea to look one last time at the tattoo of an iguana on his shoulder, its tail wrapped around his upper left arm. He got the iguana tattoo on the sly, his mother said with a sad smile, because she wouldn't let him keep one. Army spokeswoman Shari Lawrence said she could not comment on the Baddick case but said it's rare for a family to be denied one last look at a loved one. A casualty assistance officer may be able to resolve the issue, she said. The officer works with the family until the family decides the help isn't needed. Lawrence said ''a lot of families need to view the remains for closure,'' but the bodies sometimes are not viewable. In that case, the Army tries to have someone other than family members take a look. The only reason a soldier's casket would never be opened is if the body inside has been chemically contaminated or harbors a contagion, Lawrence said. On Tuesday, Baddick — with John Adams, her partner of 20 years, beside her — poured out her anguish to state Representative Keith McCall, D-Carbon. The couple plan to marry the day before Christmas. McCall told Baddick he was appalled she could not see her son's body and that he would do whatever he could to find out what happened. The family, including Andrew Baddick's father, Joseph, and his wife, Sheila, was in the capital to attend the passage of resolutions honoring Baddick and Firkal. The Legislature passed both resolutions, standing and applauding after each was voted upon. ''Show me a hero, and I'll show you a tragedy,'' McCall told the legislators, quoting from author F. Scott Fitzgerald. Baddick, the Army says, hit his head and drowned as he tried to rescue a soldier whose vehicle went into a canal near Abu Ghraib Prison during a mortar attack. The soldier in the vehicle also died. Officials said Baddick, an avid swimmer, plunged into the canal to try to rescue the man. And when it became clear the man had drowned, Baddick dove again to try to recover the man's body. That's when he hit his head and drowned, authorities said. Baddick's mother said she has yet to receive his dog tags and other effects. Baddick graduated from jump school at Fort Benning, Georgia, in February 2001, served in Afghanistan and had recently re-enlisted. He arrived in Iraq with the 82nd Airborne Division out of Fort Bragg, North Carolina, about a month before he died. Firkal, 27, died while trying to rescue a boy who had become caught in a riptide. Firkal, a volunteer firefighter, was buried with a firefighter's honors, his casket carried to St. Michael's Cemetery in Summit Hill atop a fire truck. ''Brian's death highlights the true spirit of helping others,'' McCall said. Jane Firkal said she is coping with her grief with the help of her late husband's and her own family. ''I just take it one day at a time,'' she said. 26-year-old soldier dived in to help comrade, officials say. An Army sergeant from Jim Thorpe who wanted to be a career military man has died in Iraq, his family and the Carbon County's Veterans Affairs director confirmed Wednesday. U.S. Department of Defense officials confirmed that Andrew J. Baddick, 26, drowned Monday as he tried to rescue another soldier whose vehicle plunged into a canal near Abu Ghraib Prison, Iraq. County Veteran Affairs Director Charles McHugh said an Army chaplain and a staff sergeant visited the family Tuesday night and informed them of Baddick's death. Baddick's ex-wife, Jami Sydensticker, said the family was told he dived into water to try to save another soldier, hit his head and drowned. Baddick was an expert swimmer who worked as a guide for white-water trips on the Lehigh River. Sydensticker said it would be like Baddick to try to save another person. ''If he saw somebody in trouble, he would try to help, especially if it was one of his people,'' she said. Baddick, a 1997 Jim Thorpe Area High School graduate, had been in Iraq only about a month. In 2002, he worked with computers tracking troops from Bagram Air Force Base in Afghanistan during Operation Enduring Freedom. McHugh said Baddick, who visited him during leaves from the service, wanted to make a career of the military. ''All he wanted to do was be in the Army and be a paratrooper,'' McHugh said. Baddick joined the Army in 1999 and completed basic training at Fort Hood, Texas, then graduated from jump school at Fort Benning in Georgia in February 2001. He was assigned to the 82nd Airborne Division out of Fort Bragg, N.C. Last year he re-enlisted for six years. Sydensticker, who was married to Baddick for a year and lives near Pittsburgh, said she last saw him in January. She described him as a helpful person who liked kayaking, hunting and taking their two dogs to the park. Flags at the Carbon County courthouse, Jim Thorpe schools and the community's Veterans of Foreign Wars post flew at half-staff Wednesday. McHugh, who watched Baddick grow up, was upset by the death. ''When you lose one in your hometown, your home county, it's tough to take,'' he said. Word of Baddick's death spread quickly through the Jim Thorpe area, where he worked as a guide for Jim Thorpe River Adventures during high school and after graduation. Owner Dave Kuhn said he met Baddick when he was 12 years old and took his first trip on the Lehigh River. Two years later, Kuhn said, Baddick was a proficient kayaker. Kuhn said Baddick, who called him ''Uncle Dave,'' worked on and off for him for 13 years. He said he had an easygoing personality and was well-liked by customers whom he guided down the river. Kuhn said he last saw Baddick when he was on leave in the spring when he visited him and paddled a kayak on the river. At the family home on Front Street, a picture of Baddick in his Army desert camouflage hung on the front window near a sign urging people to pray for U.S. troops. Chris Gehres of Jim Thorpe, who knew Baddick from childhood, said the military instilled more discipline and focus in Baddick. ''He certainly was a changed man,'' Gehres said. Ron Sheehan, who serves as county treasurer and director of the Asa Packer Mansion in Jim Thorpe, said Baddick's mother, Ann, had worked at the mansion. Baddick's mother was a proud military mom. She helped organize a support-the-troops rally held in Jim Thorpe in April and was part of a group of parents who shipped care packages to soldiers. She also volunteered to help with Jim Thorpe's annual July 4 fireworks display after her son told her he would be disappointed if the event was canceled. The event was in doubt because of a lack of volunteers for the festival. The sound of bagpipes filed the air in Jim Thorpe Friday as a horse drawn carriage carried a soldier through his hometown. Army Sergeant Andrew Baddick drowned last week in Iraq while trying to rescue another soldier whose vehicle fell into a canal. At St. Joseph's Church in Jim Thorpe it was a sad farewell for a hometown hero. The bagpipes and bells offered a ringing tribute for Sergeant Baddick. A horse drawn caisson carried away a devoted son and soldier. "It's a sad, sad situation. He tried to save the life of another person and lost his own," said Anna Sweden of Jim Thorpe. Friends said that was the beauty of the soldier they called A. J., always putting others before himself in the way he lived and died. "It was him, it was what he was and I can accept what happened because of that," said friend Sean O'Neill. He was one of dozens of firefighters to honor Sgt. Baddick, a volunteer firefighter himself. "He's a brother. We all honor our brothers. He was a good friend of mine from kayaking. I knew him well, so we honor our own," added O'Neill. Sergeant Baddick's friends said his passion was kayaking. His wet suit sat empty inside the church, surrounded by pictures of happier times. Flanked by those who are called to serve, Baddick received the honor of both a military and a firefighter's funeral. 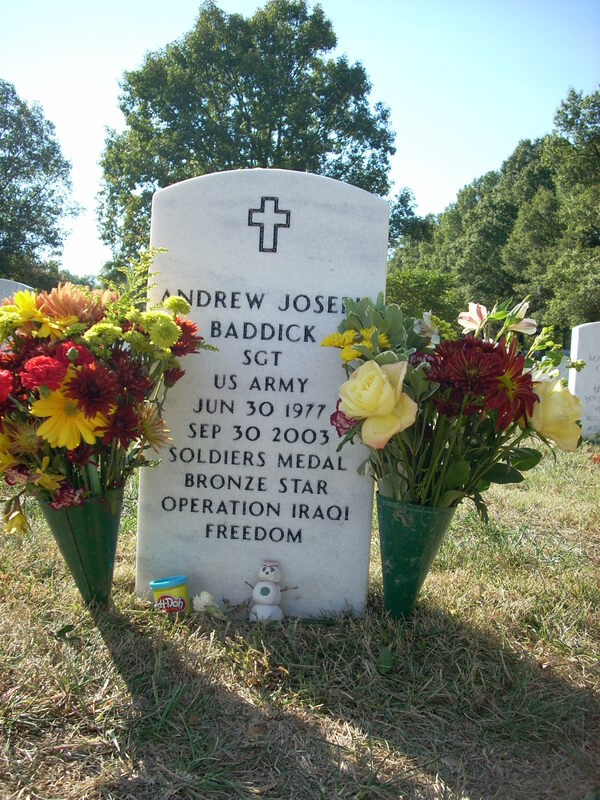 Sergeant Baddick will be buried at Arlington National Cemetery with full military honors. 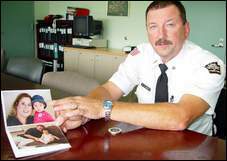 On September 30, 2003, Joseph M. Baddick received the phone call that every parent dreads: his son was dead. Sergeant Andrew J. "A. J." Baddick, a Jim Thorpe, Carbon County, native stationed in Iraq with the Army's 82nd Airborne Division, had died the night before while trying to save the life of a fellow serviceman. Last Friday, Joseph Baddick opened his mailbox and found a letter from his late son, written shortly before his death. "When I first saw the letter, I cried," said Baddick, 51, who lives in Centre Township in Berks County with his wife, Sheila, A. J. 's stepmother. "But when I opened it, and read it, I smiled." In the letter, his son had talked a bit about his two-month tour of duty in Iraq, and recounted his part in a mission in which six Iraqi prisoners had been captured. But the last few sentences were particularly poignant to Joseph Baddick. His son ended his letter by reminding his father of a conversation that they had a few months earlier, when A. J. was home on leave. "He wanted to remind me about what he had told me when I last saw him, that if anything happened to him, he wanted to be buried in Arlington National Cemetery," Baddick said. Many years before, when Andrew was just a boy, Joseph had taken him and his older sister, Elizabeth, who now lives in Jim Thorpe, to visit Arlington National Cemetery. The memory of that visit made a lasting impression on young Andrew, and in the end, it had become part of his private last will and testament: to take his place of honor among them in death. "It meant so much to him, to have the right to be buried there among so many honorable men, these fallen warriors. He wanted to be a part of that," Joseph Baddick said. Andrew Baddick grew up in Jim Thorpe, where he lived with his mother, Ann Baddick, until graduating from Jim Thorpe Area High School in 1997. He then worked as a river guide for Jim Thorpe River Adventures, a river rafting company on the Lehigh River, but found his true calling when he enlisted in the Army in 1999. He completed basic training in Fort Hood, Texas, then went onto jump school in Fort Benning, Georgia, graduating in 2001. He decided to re-enlist for six more years, and, like his father before him, become a member of the 82nd Airborne. Joseph Baddick had served in the 82nd Airborne from 1970 to 1973. For six months, Andrew Baddick served at the 82nd Airborne headquarters in Bagram Air Force Base in Afghanistan as part of Operation Enduring Freedom. In 2002, he was awarded the Army Commendation medal for Meritorious Service, and in 2003 the Army Achievement Medal. For many years, Andrew Baddick had also been a volunteer firefighter and ambulance volunteer in Jim Thorpe, so the fact that he died while trying to save another person's life doesn't surprise those who knew him, his father said. "It doesn't surprise me that he died being a hero," Joseph Baddick said. "I'm sure he didn't even think about it. I'm sure that he'd dive right in to save someone's life. My son would do that." In the days following his son's death, Joseph Baddick heard different accounts of what transpired that fateful night, but later talked to an eyewitness, who was there when his son perished. Andrew Baddick was one of several soldiers traveling in a four-vehicle convoy that was responding to a mortar attack near Abu Ghraib prison on the west side of Baghdad, around 10:45 p.m. The Humvee in front of them, carrying three military police officers from the 800th Military Police Brigade, suddenly swerved to avoid an obstacle in the road, and plunged into a nearby canal. Andrew, being an experienced swimmer and kayaker, instinctively responded to a call for help, his father said. "He had no fear of the water - he was an experienced swimmer and knew how to handle himself in raging water," Joseph Baddick said. "He jumped right in to rescue the driver for the Humvee, who was trapped." But the turbulent water must have suddenly whirled the submerged vehicle around, striking A. J. in the head. "They think he lost consciousness at that point, and drowned," Joseph Baddick said. The trapped driver, Sergeant Darrin K. Potter, 24, of Louisville, Ky., also drowned, but the other two solders in the vehicle managed to escape. Baddick, though heartbroken over his only son's death, said he harbors no bitterness. "My feeling is that I believe fully in what President Bush is doing. We watch the news every night and hear that more soldiers are killed, but if it's not somebody you know, you're not close to it. It doesn't really hit home," he said. "But that's the price we have to pay for freedom," Baddick added. "It gives me some comfort knowing that my son died being a hero." Sergeant Andrew J. Baddick spent his last hours trying to find a comrade's body. 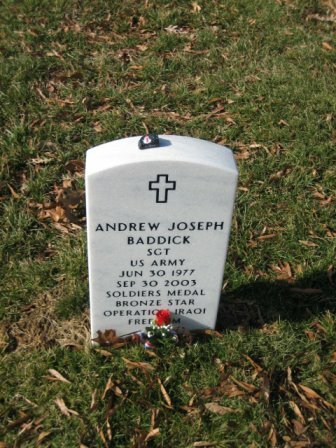 Sergeant Andrew J. Baddick spent hours Sunday night in the waters of a canal near Iraq's Abu Ghraib Prison, desperately trying to find, then retrieve, the body of a comrade whose Humvee had crashed into the channel. Baddick, 26, of Jim Thorpe, was among divers sent to the site after the vehicle carrying three U.S. military police crashed into the water. Two escaped the wreck, but Sergeant Darrin K. Potter, 24, of Louisville, Kentucky, did not. ''They spent five hours looking for the missing man, and recovered his body at about 2:30 a.m.,'' Charles McHugh, a Baddick family friend and the Carbon County Veterans Affairs director, said Thursday. While in the water, Baddick — who had been in Iraq about a month — hit his head and drowned. McHugh and Department of Defense officials gave that account as Jim Thorpe mourned the first Carbon County soldier killed in Iraq. Those who knew Baddick said they were stunned at the manner of his death, because he grew up swimming, rafting and kayaking the Lehigh River, and had worked as a guide for white-water trips on the Lehigh. Wrzeszewski spoke on behalf of Baddick's family, who she said are distraught. The family is waiting for the Army to deliver Baddick's body home for services in Jim Thorpe and burial at Arlington National Cemetery in Virginia. Wrzeszewski said Baddick, who was engaged to be married in the spring, had joined the Army, just as his father did, and joined the 82nd Airborne Division, where he was a paratrooper. And like his father, Baddick was stationed at Fort Bragg, North Carolina. Wrzeszewski and others remembered Baddick — who served in Afghanistan last year, then re-enlisted for six years — as a dedicated military man who always wanted to help others. Carbon County Commissioner Charles Getz, who once owned a white-water rafting company, said Baddick worked a few times for him as a guide. ''He was a nice young man,'' Getz said. Baddick's death was the second in less than two days for heroes in Carbon County. As Jim Thorpe mourned Baddick on Thursday, a few miles away, Brian Firkal, a 27-year-old teacher and volunteer firefighter from Nesquehoning, was buried with the full honors of a firefighter killed in the line of duty. Firkal, on vacation Saturday in Maryland, drowned trying to rescue a boy struggling in the surf off Ocean City. Firefighters from many departments attended services for Firkal in dress uniforms, and his casket was carried to St. Michael's Cemetery in Lansford atop a fire truck. County commissioners observed a moment of silence Thursday morning for Baddick and Firkal, who grew up in small towns a few miles apart and had joined local fire companies when they were teenagers. Both were said to have been driven by a desire to help others. Firkal became a printer and later a graphic arts teacher at Lehigh Career and Technical Institute, while Baddick pursued a career in the military. At the county commissioners meeting, McHugh, the county veterans affairs official, read a poem and prayer in memory of them. ''We lost two of the best of the best,'' McHugh said. A bus provided by two local banks wasn't enough to bring all the residents of Jim Thorpe, Pennsylvania, who wanted to attend the funeral of Army Sergeant Andrew Joseph Baddick at Arlington National Cemetery yesterday. So a friend of the fallen soldier donated another one to bring dozens more wanting to pay final respects to their hometown hero. "A.J.," as he was known to all, had been in Iraq just a few weeks when he died trying to rescue another soldier whose vehicle had toppled into a canal west of Baghdad. 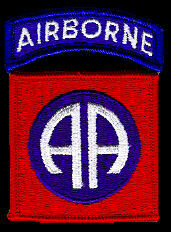 A paratrooper with the 82nd Airborne Division, he was posthumously awarded the Bronze Star. Though shocked by his death, those who knew Baddick were not surprised that the 26-year-old gave his life trying to save a comrade. According to the Army, a four-vehicle convoy was responding to reports of a mortar attack outside Baghdad on September 29 when one of the vehicles plunged into the canal. Baddick dived in to help, but he didn't surface. One of the three soldiers in the vehicle, Sergeant Darrin K. Potter, 24, of Louisville, also drowned. "He was trying to save his buddy when he died. He always put himself in harm's way for somebody else," said Pat Gillespie, 30, an Army airborne specialist who grew up with Baddick in Jim Thorpe, near Allentown in eastern Pennsylvania. "He seemed to make friends with anybody." Near Baddick's grave site yesterday, a seven-member rifle party fired into the drizzly afternoon mist. Family members clutched red roses and other flowers, which they gently placed on the long gray casket. Nearby was a box brought from home that held a tiny teddy bear and other tokens of Baddick's childhood. As the service ended, General Richard Rowe, assistant division commander with the 82nd Airborne, handed American flags to the soldier's parents, Ann and Joe Baddick. A funeral Mass for their son was held Friday at St. Joseph's Catholic Church in Jim Thorpe. The newly dug grave was flanked by those of others who, like Baddick, had died in Iraq and one who had died in Afghanistan. Baddick had served there before being sent to Iraq in early September. Since he was a child, friends recalled, he had wanted to be a paratrooper like his father. "It's all he ever talked about," said John Adams, who helped Ann Baddick raise her son. Neighbors remember the youngster being a hilarious handful; one had even appropriated the nickname "Dennis the Menace" for the blondish mischief-maker. "He was everywhere," recalled Regina Scherer, 35, whose family had shared a duplex with the Baddicks. "Once, he just popped his head in through the dining room window." As a teen, Baddick helped out on rafting excursions on the Lehigh River and then worked as a river guide for several years after high school. More than six feet tall and an avid kayaker and swimmer, he was described by friends as having a "lean-and-mean" build. He also worked with the volunteer fire squad in town. "He was always willing to help," said Frank Lauth, captain of the Jim Thorpe Fire Department. "That kid, he doesn't go halfway." Army Staff Sergeant Gary Leleux roomed with Baddick at Fort Hood in Texas and preceded him to Afghanistan. When Baddick's division was among those that came to relieve his own, Leleux was gathering his gear to leave when he heard a voice behind him. " 'Hey, put that down!' " Leleux remembered Baddick calling. "Man, what's up?" Out of the thousands of soldiers, Baddick had tracked down his buddy for a quick hello. "The last thing you're expecting is for an old friend to show up," Leleux said. It was to be the last time they would see each other. Yesterday, Jim Thorpe firefighters put black ribbons over their badges, Lehigh river guides put their hands over their hearts and, with Baddick's parents, his sister and his fiancee, they mourned a beloved son and comrade. Sergeant Andrew J. Baddick died more than a month ago while attempting to save another soldier whose vehicle had plunged into an Iraqi drainage canal. Three men were saved that day. Sergeant Baddick died in a heroic effort to save a fourth soldier who didn't make it. Who was the man that a 26-year-old Jim Thorpe soldier sacrificed his life to try and save? The Baddick family found out recently, when they received a letter from the officer who was in charge of the deceased while he was stationed in the U.S.
"From the men and women of the Kentucky National Guard, please accept our deepest condolences for the loss of your son Andrew. At a time like this I realize there is little I can say to lessen your sense of sorrow and loss; however, I would like to express my personal gratitude for the efforts made by your son to save the life of one of my soldiers, Sergeant Darrin K. Potter, age 24. I had the privilege of knowing Sergeant Potter and would like you to know that he was an exceptionally fine young man. Sergeant Potter was a member of the 223rd Military Police Company, Kentucky Army National Guard. His squad was engaged in joint patrolling with your son's unit in an attempt to locate and disrupt an enemy mortar crew that had previously attacked American soldiers, causing loss of life as well as injuries. Although this is not an official report, based on my conversations with members of Sergeant Potter's unit, it appears that the patrol was moving toward the enemy locations when his vehicle failed to negotiate a sharp turn at the top of a steep bank and went into a deep and swiftly moving drainage canal. Your son's unit immediately came to their aid, assisting two soldiers to shore and, when it became apparent that a third soldier would not be able to make it, your son unhesitatingly went into the water after him and saved his life. After successfully locating that soldier and helping him to shore, your son reported that there was someone else down there, presumably Sergeant Potter, and went back in after him; neither of them surfaced after that point and their bodies were recovered sometime later. In discussion with Major General Swannack, Commanding General of the 82nd Airborne Division, I learned that your son was an exceptionally well-regarded young man who had already contributed much and had great future potential. Clearly, he exemplified the truth that no greater love hath a man than he lay down his life for his brother. Please accept our deepest sympathies for his loss. joined him on a recent trip to North Carolina to visit with President Bush. For Tamaqua native Joe Baddick, the price of war isn't measured in dollars and cents. It's measured in memories and tears. Baddick's only son, Sergeant Andrew. J. 'A. J." Baddick, 26, a 1997 graduate of Jim Thorpe Area H. S., drowned in Iraq on October 1, 2003, while taking heroic measures to save a life. On that night, A. J., an outstanding swimmer, dove into a swift-moving canal and helped to rescue one soldier. But while trying to rescue a second soldier trapped in a Humvee, Baddick lost his life. On June 28, family members were invited to meet President George Bush at Fort Bragg, North Carolina, prior to Bush's televised address to the nation. Joe and wife, Sheila, of Mohrsville, were joined by A. J. 's mother, Ann Baddick of Jim Thorpe, and A. J. 's sister, Elizabeth, along with her husband Terry Hoherchak, a Lehighton native, and the couple's daughter, Andi Rose, 2. Baddick said meeting the president was not only a pleasure, but therapeutic. The commander in chief put everyone at ease from the moment he entered the room. "There was no formality," said Baddick. "He had two Secret Service men with him and a White House photographer. He came in and said 'It's really me,' and that broke the ice." Baddick was impressed by Bush's sincerity, saying that the president became teary-eyed during the course of the conversation. Baddick encouraged the president to push forward with the mission. "I told him 'please don't drop the ball – or the lives of my son and the others would've been for nothing.'" Baddick said Bush looked him directly in the eye and explained that his message would be loud and clear. "You listen to my speech tonight and you'll know where I stand," offered the president. In that speech, Bush promised that America would do what was necessary to make Iraq a free country. Bush handed each family member a special memento - a brass 'challenge coin' featuring a colorful, enamel image of the Presidential Seal. Family members estimate that Bush spent about 10 minutes chatting. Baddick lauds the demeanor of the most powerful man in the world. "This man is on a mission. He's the genuine article. He wants to bring peace to the Middle East." The president also visited with 30 other families, all of whom had lost a loved one in the war. Baddick had a chance to talk with many of those individuals prior to meeting the president. For the most part, he said, the majority seem to support their leader. A. J. was a member of the U. S. Army 82nd Airborne Division 504 Parachute Infantry Regiment. He had asked to be attached to that unit for a special reason. "He wanted to be just like Dad so he requested it when he re-enlisted," recalls his father while speaking from his job post as zone lieutenant for the State Correctional Institution at Mahanoy. Joe served in the same unit following his graduation from Marian High School in 1970. Baddick said A. J. spent six months in Afghanistan prior to the assignment in Iraq. A. J. understood the dangers, as do others who enlist in the military, he said. A. J. was posthumously awarded a Bronze Star for heroism and a Soldier's Medal for saving another soldier's life. Baddick is proud of A. J. 's courage and contributions, and for his acts of bravery in the face of danger. It'll always remain a bright spot in his life. For sure, the past three years have been a particularly difficult time. He lost his father in 2002, then A. J. in 2003, and his mother, Rose, passed away in 2004. While driving home from the meeting with Bush, Baddick stopped at Arlington National Cemetery to visit his son's grave. There, he noticed a military funeral taking place nearby. The sight tugged at his heart. Another young soldier had died. Putting his own sorrow aside, Baddick walked over and helped comfort the grieving parents - total strangers sharing a painful bond. Ann Baddick, left, the mother of Army Sgt. Andrew Joseph Baddick, who died in Iraq, clutches the flag from her son's coffin during memorial services yesterday at Arlington Cemetery. Seated next to her are Sgt. Baddick's sister, Elizabeth Hohorchak, his grandmother, Rose Baddick, and his father, Joe Baddick.